To handle such extremes, advanced onboard control systems are responsible for keeping the interior at a very comfortable 75°F, creating an environment where astronauts can live and work for extended periods of time. Such engineering feats are accomplished via two onboard primary control systems. The first is called Thermal Control System (TCS) while the other is called the Environmental Control and Life Support system. They work in conjunction to supply the ISS with water and oxygen, to regulate temperature and air pressure, to maintain air quality, and to manage waste. The TCS must work continuously to regulate the temperature not only for astronauts, but for the critical instruments and equipment inside the ISS as well. This is accomplished through the continual monitoring and adjustment of numerous subsystems located inside and outside the station. Inside, liquid heat exchangers pump fluids throughout closed-loop circuits to collect, transport, and expel excess heat. Outside the station a separate system circulates anhydrous ammonia, itself a very dangerous compound, to transport heat while cooling the station. These systems lead to various radiators that release the excess heat into space during times when cooling is needed. Much closer to home, today’s heating, air conditioning, and refrigeration technicians must be better trained than ever to capably diagnose and repair increasingly complex equipment. 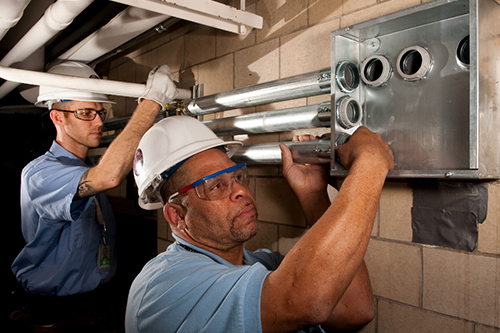 Thankfully, National ITC (NITC) offers a variety of certifications for tradespersons looking to forward their careers. One of their most popular HVAC certifications and licenses is their STAR HVACR Mastery Certification, which is geared for individuals who have already completed a UA training program (or its equivalent) and who possess five years of experience in the industry. Upon passing, the candidate has truly earned the title of master and they have justifiably earned the right to be considered a highly qualified & highly skilled individual. Whether you’re a training director, association representative, employer representative, or an individual applicant, NITC is there to help you along the way. Contact NITC at (877) 457-6482 to learn more about how our products help prepare the best, most reliable, and safest trade professionals possible through our wide range of industry certifications, while helping you exceed customer expectations in the process. Have your personnel certified with the certification company, National ITC, today!